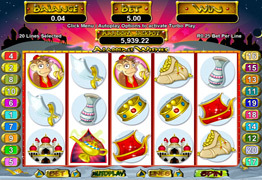 Online slots with a Fairy Tale and Nursery Rhyme theme. Play slots such as Forest of Wonders which is based on the Alice in Wonderland Fairy Tale, Bar Bar Black Sheep Slot, Aladdins Wishes Slot, Rhyming Reels - Queen of Hearts Slot and Jack and the Beanstalk Slot. 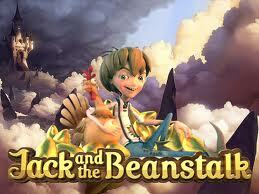 Live happily ever after in the fairy tale world of Jack and the Beanstalk which is a fun-filled and exciting giant of a slot. It’s not just the beans that are magical in this game; the innovative Walking Wild feature will shift any wild symbols on the reels to the left, awarding you with a free re-spin on each shift as long as it is present on the reels. And that’s not all, when you climb up the beanstalk to the Free Spins feature, not only are your wins multiplied, you also have the chance to unlock the Treasure Collection Feature, where you can start to unlock a variety of enhanced bonus features, and some gigantic rewards! 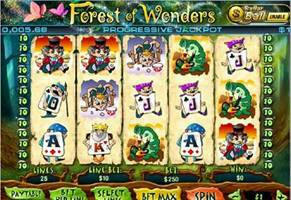 Forest of Wonders Slot is one of the new playtech games - a 25 line video slot with an "Alice in Wonderland " theme. It features the "Dollar Ball " side game and two bonus rounds. One Bonus round gives the player free spins and the other allows you to pick 3 bonus symbols that will make up the win. This is an extremely entertaining slot with great graphics and features. 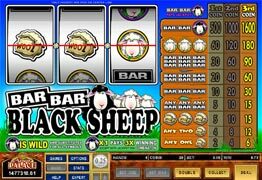 Bar Bar Black Sheep is a fun 3 reel, 1 payline classic slot from microgaming. 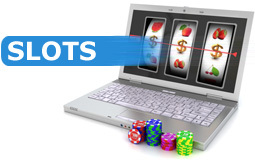 It is a great slot for beginners as it is easy to understand. Bar Bar Black Sheep has a wild and multiplier symbol - the black sheep which triples the win if it is included in a winning payline. The jackpot is 1600 coins. 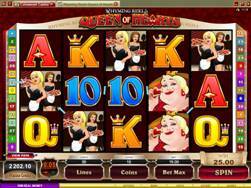 Rhyming Reels – Queen of Hearts is a microgaming bonus slot released February 2011, which is based on an old poem from 1782. The poem is about a knave that stole the Queen's tarts. The slot is a 30 payline, 5 reel slot with a free spins feature and stacked wilds during the feature. 3 scattered crowns will active 10 free spins at 2x multiplier. The free spins can be retriggered. This slot certainly lives up to the high standards we expect from RTG. With a bonus feature paying big bucks if you pick the right magic lamp, the game is as entertaining and exciting as any other from the RTG stable. The bonus feature is triggered when 3 or more magic lamps show. They can show right to left or left to right. Depending on how many lamps are triggered the player then can choose 3.4 or 5 lamps. Cash rewards are hidden behind each lamp and additionally there is a special lamp giving the player 25 free spins. A nice feature is that the bonus can be won again during the free spins, and watch out for Aladdin himself – if he appears in your line your payout is doubled! You also have the opportunity to use the Aladdin symbol as a wild.